20 A None No Power Seat 20 A is a standard Economy Class seat that may not recline due to the exit row behind. 20 B None No Power Seat 20 B is a standard Economy Class seat that may not recline due to the exit row behind. 20 C None No Power Seat 20 C is a standard Economy Class seat that may not recline due to the exit row behind. 20 J None No Power Seat 20 J is a standard Economy Class seat that may not recline due to the exit row behind. 20 K None No Power Seat 20 K is a standard Economy Class seat that may not recline due to the exit row behind. 20 L None No Power Seat 20 L is a standard Economy Class seat that may not recline due to the exit row behind. 21 A None No Power Seat 21 A is a standard Economy Class seat that has extra legroom due to the exit however, also has limited recline due to the exit row behind. The tray table is in the armrest, making the armrest immovable and slightly reducing the seat width. There is no floor storage for this seat during take-off and landing. 21 B None No Power Seat 21 B is a standard Economy Class seat that has extra legroom due to the exit however, also has limited recline due to the exit row behind. The tray table is in the armrest, making the armrest immovable and slightly reducing the seat width. There is no floor storage for this seat during take-off and landing. 21 C None No Power Seat 21 C is a standard Economy Class seat that has extra legroom due to the exit however, also has limited recline due to the exit row behind. The tray table is in the armrest, making the armrest immovable and slightly reducing the seat width. There is no floor storage for this seat during take-off and landing. 21 J None No Power Seat 21 J is a standard Economy Class seat that has extra legroom due to the exit however, also has limited recline due to the exit row behind. The tray table is in the armrest, making the armrest immovable and slightly reducing the seat width. There is no floor storage for this seat during take-off and landing. 21 K None No Power Seat 21 K is a standard Economy Class seat that has extra legroom due to the exit however, also has limited recline due to the exit row behind. The tray table is in the armrest, making the armrest immovable and slightly reducing the seat width. There is no floor storage for this seat during take-off and landing. 21 L None No Power Seat 21 L is a standard Economy Class seat that has extra legroom due to the exit however, also has limited recline due to the exit row behind. The tray table is in the armrest, making the armrest immovable and slightly reducing the seat width. There is no floor storage for this seat during take-off and landing. 22 A None No Power Seat 22 A is a standard Economy Class seat that has extra legroom due to the exit. The tray table is in the armrest, making the armrest immovable and slightly reducing the seat width. There is no floor storage for this seat during take-off and landing. 22 B None No Power Seat 22 B is a standard Economy Class seat that has extra legroom due to the exit. The tray table is in the armrest, making the armrest immovable and slightly reducing the seat width. There is no floor storage for this seat during take-off and landing. 22 C None No Power Seat 22 C is a standard Economy Class seat that has extra legroom due to the exit. The tray table is in the armrest, making the armrest immovable and slightly reducing the seat width. There is no floor storage for this seat during take-off and landing. 22 J None No Power Seat 22 J is a standard Economy Class seat that has extra legroom due to the exit. The tray table is in the armrest, making the armrest immovable and slightly reducing the seat width. There is no floor storage for this seat during take-off and landing. 22 K None No Power Seat 22 K is a standard Economy Class seat that has extra legroom due to the exit. The tray table is in the armrest, making the armrest immovable and slightly reducing the seat width. There is no floor storage for this seat during take-off and landing. 22 L None No Power Seat 22 L is a standard Economy Class seat that has extra legroom due to the exit. The tray table is in the armrest, making the armrest immovable and slightly reducing the seat width. There is no floor storage for this seat during take-off and landing. 36 A None No Power Seat 36 A is a standard Economy Class seat in the last row of the aircraft whose proximity to the lavatories and galley may be bothersome. 36 B None No Power Seat 36 B is a standard Economy Class seat in the last row of the aircraft whose proximity to the lavatories and galley may be bothersome. 36 C None No Power Seat 36 C is a standard Economy Class seat in the last row of the aircraft whose proximity to the lavatories and galley may be bothersome. 36 J None No Power Seat 36 J is a standard Economy Class seat whose proximity to the lavatories and galley may be bothersome. 37 J None No Power Seat 37 J is a standard Economy Class seat in the last row of the aircraft whose proximity to the lavatories and galley may be bothersome. 37 K None No Power Seat 37 K is a standard Economy Class seat in the last row of the aircraft whose proximity to the lavatories and galley may be bothersome. 37 L None No Power Seat 37 L is a standard Economy Class seat in the last row of the aircraft whose proximity to the lavatories and galley may be bothersome. Air China is has introduced a newly reconfigured Boeing 737-800 aircraft to their fleet. This version has 8 seats in First class and 159 seats in Economy for a total of 167 passengers. No window for 17A!!! Starboard side does have a window, but not the port side. 18A has 2 windows, if you recline, you can steal their front window, right in front of the wing. No other seats on the B737 are missing windows. 17A is missing a window. The aircraft feels overcrowded. 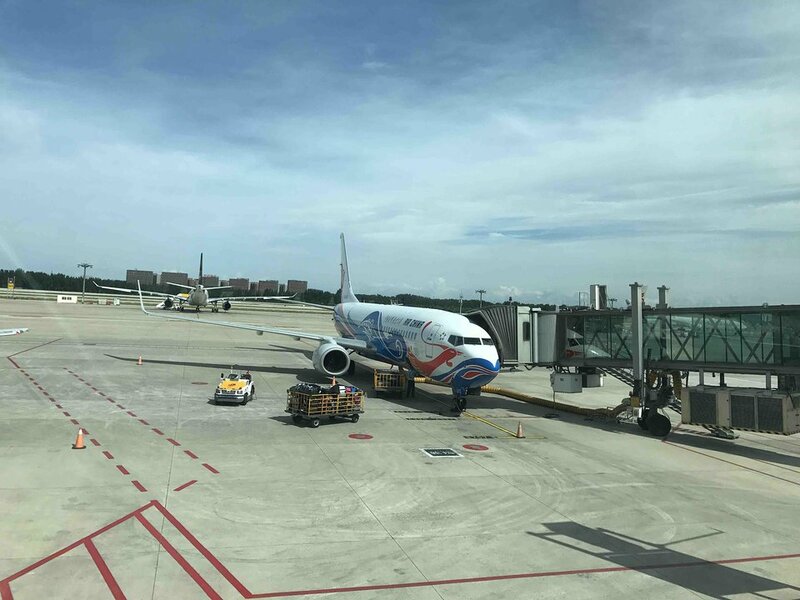 I was able to change into an emergency row on the way to CNX, and bought an emergency seat for the return flight on airchina.com for an additional $32.00 (200 RMB.